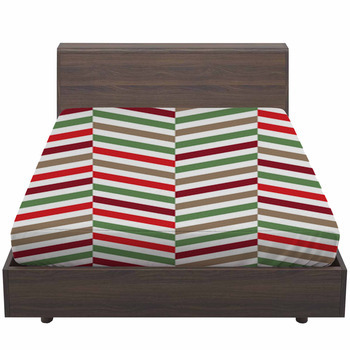 Our chevron bedding comes in a variety of distinct styles of this classic pattern. Choose a natural combination of colors like earthy brown and sky blue for unique bedding in thick lines that are shaded to create stylish contrast and depth. Or, choose a pattern that alternates colors not only vertically, but horizontally in order to create a truly unique style. 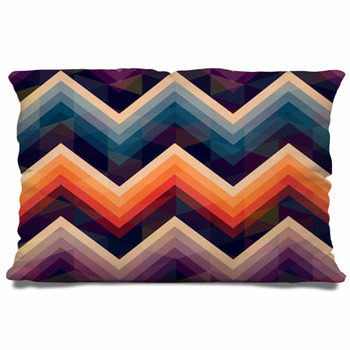 Another twist on the standard chevron motif adds double peaks to the tops of the lines, creating shapes out of deep pink, dark orange, and light blue. 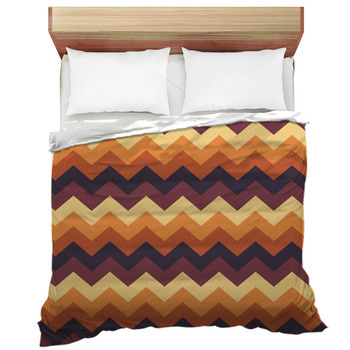 One of our most masculine and sophisticated chevron bedding designs employs fine lines of shiny copper set on solid black. 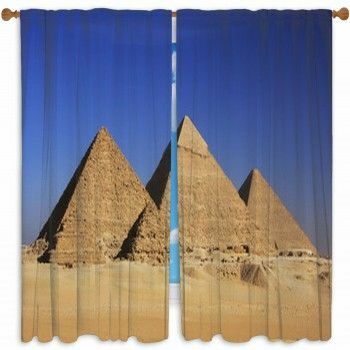 These energetic and fun variations on bedding will give your bedroom an artistic atmosphere unlike any seen before. And if none of these designs are fit for the family-crest, then design your own chevron pattern! VisionBedding offers full personalization and customization options so your chevron style can mimic where chevron started: on European family crests. Try and raise the luminance for color that is bright as real life on your chevron, The colorful zigzagging configurations will remind you of the prettiness of a painted Easter egg shining in the springtime sunlight. 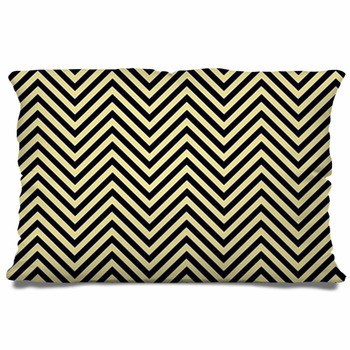 Go the other direction and sap color for a moody and clean chevron in monochrome. Our chevron bedding comes in standard sizes starting with Twin, to Twin XL, Queen, and King, but also in custom sizing for a V pattern that is as large or small as you need it to be. 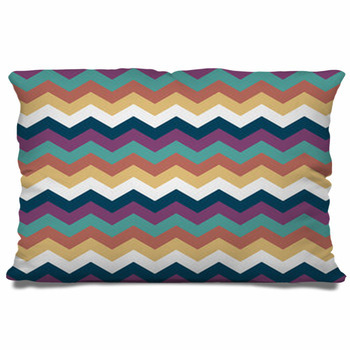 Enjoy the sense of motion and joyful excitement that chevron styles bring by choosing a chevron comforter or chevron duvet cover that feature layers of zigzagging lines filled with bright and classy color schemes. For a style that is sure to set any kids heart racing, go for a Twin size comforter design that portrays this zigzag style with thin rows of baby blue and white. Teens love the optical illusion created by narrow black and white patterns, especially on their sheets. 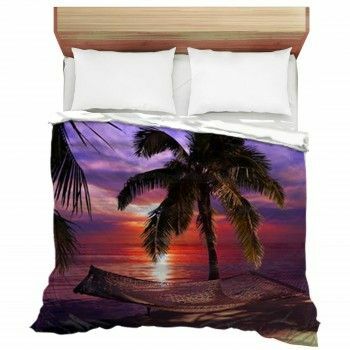 Give yourself the relaxation of pastel colors with a bedding design that shows broad streaks of violet, pink, and orange mixed together in a rainbow of colorful style. 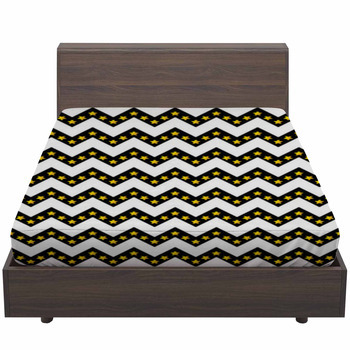 Chevron bedding can begin a theme in any bedroom. For a timeless and artistic space, go with chevron styled in rays of glimmering light over portions of copper, making for a unique bedding style fit for all ages. Chevron styled in pairs of dark gray stripes with thinner white stripes lends itself well to any bedroom's color scheme. Select a variety of colors and sizes to stylize an entire bedroom decor from our chevron themed bedding and custom chevron pillows. Fun retro chevrons with Neapolitan designs will give your bedroom a vintage appeal that will match with other fun retro home furnishings. 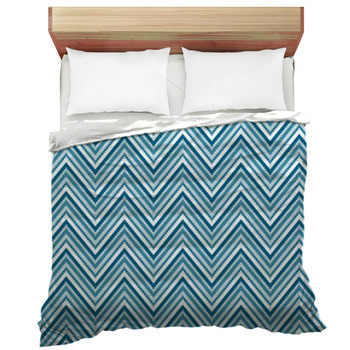 Our chevron comforters will give your home a brand new look, easily complemented with our other matching products. Paint your living room with our chevron themed wall murals and window curtains to pair perfectly with a duvet cover adorning your bed. 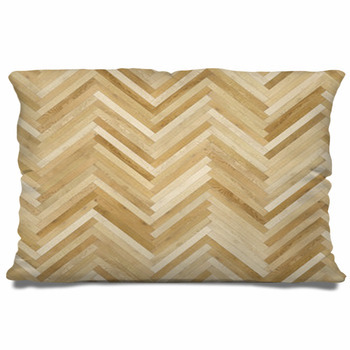 Chevron bedding is what you need if you think highly of family history and the sense of honor in a chosen family. Whether you're a military vet or active duty member, or perhaps the ancestry historian in the family, chevron bedding will fulfill through design what you already fulfill through your actions. Make a mark in your home with chevron style bedding. Create a new-style family crest that you can pass down through the family with VisionBedding.